Since walking while working is somewhat novel still, many people have questions and concerns. Since the treadmill desks are rather pricy, that adds to the uncertainty, since it’s difficult to just pick one up to try out and see if it’s right for you. However, more and more people are going this route, both at home and at work, so if you ask around it’s likely somebody you know already has a treadmill desk you can try. 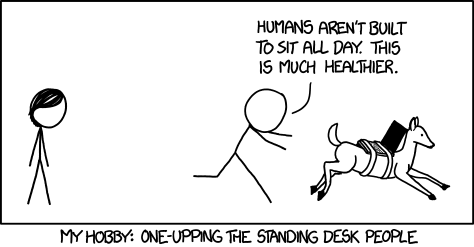 Barring that, trying out a standing desk can be as easy as stacking some (stable) things on you current desk and setting your laptop or keyboard up on this higher surface, and working from there for a while to see how you like it. In any case, I’ll try to answer some of the more common questions about this setup here. Note that in Fitbit’s graphs above, each bar represents a five minute period, so showing 300 or 500 steps in 5 minutes is still just a walking pace. None of these graphs show, for instance, an actual aerobic running workout. This is just walking at a slow-to-medium pace, which generally doesn’t distract or make typing (or thinking) difficult). The model of treadmill desk I have allows setting the speed in .1 MPH increments between 0 and 4 MPH, and typically for work that involves typing or using the mouse (as opposed to, say, watching a video) I will keep my speed between 1 and 2 MPH. It’s also worth noting that the total steps in the top graph was 12,095, in the bottom it was 18,977, and in a typical workday without using the treadmill desk at all, it would often be under 5,000. Now, let’s address some questions I’ve had myself, or have been asked by others, about this crazy idea of actually getting work done while walking. How do you like the Lifespan TR1200 DT? I’m very pleased with it. As I mentioned above, I picked mine up locally by finding someone who had an almost-new one they wanted to sell, so I paid much less than retail. That made trying it out much easier to stomach (and increased the Wife Acceptance Factor). It has a fairly large desktop, with a built-in wrist rest that I find to be very comfortable to use. The wrist rest spans the whole front of the desktop surface, so it helps with the mouse as well as the keyboard. Also, the front of the desk is slightly curved, which I like because it lets me be a little bit closer to the desk, while still letting me set things off to the side (phone, mouse, coffee, etc.). The settings work fine for me. I don’t use any of the custom settings, or track things like steps, calories, distance, weight, etc., mainly because I use Fitbit for that. The controls beep every time you make a change, which I’ve read others have found annoying enough that they’ve filled the speaker hole with hot glue to muffle the sound, but it hasn’t bothered me enough to worry about that. The treadmill itself is super-quiet, at least compared to another treadmill I’ve had for home use (bought over 10 years ago, so maybe they’re all much quieter now). You can be on a phone or skype call while walking and nobody can tell (though I don’t walk while recording Pluralsight courses, since I don’t want to have the risk of errant sounds to have to clean up during editing). The desktop is height-adjustable, but not automatic. If you want an automatic (motorized) desktop, it’s going to cost a lot more. You can sit a barstool height chair on the treadmill (or roll the treadmill out of the way – it’s not attached to the desk except via a couple of cables that can easily be unplugged), so if you want to take a break and sit down at the desk, it’s not terribly difficult to achieve. Personally, if I need a break from walking, just standing for a bit works for me, and if I need more of a break than that, I’ll typically leave my desk and go do something else for a bit (or switch to checking email, etc., from my iPad, maybe in a comfortable chair or at a table). Note that when using the Tyke Dual Monitor Stand Desk Clamp with this particular desk, you’ll need to mount the clamp slightly off-center, since the desktop includes a cable run in it. There’s also a metal cable-tray that attaches at the rear of the desktop that I had to remove in order to use the monitor clamp, but that wasn’t a big deal in my case (the power strip I had had in the cable tray is now simply hanging from the back of the desktop, which isn’t necessarily ideal, but it’s working. And of course I could always mount the power strip to the underside of the desktop with screws). Multi-Tasking is Bad; Why isn’t Walking While Working a Bad Idea? There’s plenty of research available to suggest that multi-tasking can detract from our ability to work effectively. Doing multiple tasks at once means none of them have our full attention, and some studies have shown that heavy multitaskers tend to be less able to focus on the task at hand in the presence of distractions. There are also plenty of practices in use in software development that are specifically designed to reduce multitasking and distractions. One of the fundamentals of kanban is to reduce work-in-progress, to maximize the rate at which tasks are completed. The pomodoro technique prescribes eliminating all distractions for a 25-minute period during which all of our attention can be directed at the task-at-hand. Pair programming works best when both parties are fully engaged in the task-at-hand, and it can be much more difficult to allow ourselves to be distracted by email, twitter, etc. when we’re working with a partner on a task. As someone who feels there is value in all of these techniques, I can tell you that walking while working does not, typically, qualify as a separate task we’re focusing on that distracts from our ability to work effectively. You can think of any number of things you’re doing while you’re working, or while you’re reading this. Maybe you’re sitting. Maybe you’re breathing. Maybe you’re walking. None of these is requiring a huge amount of concentration from you, typically (unless you’re sitting on a bucking horse, or walking through a crowd and having to navigate your path). Walking in place, at a pace that doesn’t require you to breathe hard or perspire, is not terribly distracting for most tasks, most of the time. Are there times when I want to take a break from walking, so I can really concentrate on something? Certainly. But for most of my work, and most of the time when I haven’t already been walking for hours without a break, it doesn’t even enter my mind that I’m walking. And frequently, rather than distracting, walking can help me think. If you’ve ever gone for a walk, alone or while having a conversation with someone, and found when you were done that you were less stressed and had solved, at least in your mind, some problems that had been causing you stress, you’ve worked effectively while walking. How do you avoid getting all sweaty? If you’re just walking at a light pace, this shouldn’t be an issue. At least, it hasn’t been for me. Of course, you can always adjust your air conditioning, or point a fan at your workspace, if those help. My treadmill desk is currently in my basement, the coolest part of the house, so it’s generally comfortable. Loose-fitting non-chafing clothes are probably a good idea, but I’ve been fine in anything from running shorts to the same khakis I wear to the office. How can one afford one of these setups? There are plenty of options for do-it-yourself alternatives to the LifeSpan $1500-retail treadmill desk. I know Julie Lerman has had some success sitting her bicycle trainer in front of her desk to work. Plenty of others have used off-the-shelf Ikea or similar furniture to create standing desks, or to build a desk around a standard, less-expensive treadmill. And you may be able to get lucky, like I did, and find one locally via Craig’s List or your newspaper classified section for much less than retail. When you consider the cost of a decent desk, along with the cost of a small, quiet treadmill, the overall cost of the LifeSpan unit is still a bit more, but not unreasonably high. If you factor out a couple of hundred dollars for a decent chair (that you won’t need, if you’re always walking or standing), then the price becomes even more reasonable. And if you’re doing professional work using this equipment, you can very likely write it off as a business expense (consult your financial advisor, I am not a lawyer or accountant, YMMV, etc.). How do you pair program on a treadmill desk? I haven’t tried it, and I don’t know if it’s practical. So far, I’ve only used my setup at home, to work on my own. If I were to get one of these at the Telerik office where I work, it would probably be a shared workstation, where different employees could go to check email, take a customer call, etc. for an hour or two at a time. Alternately, I might try to get one for my own primary use, where currently I don’t ever pair program with anybody (on the rare occasions when I get to pair program, I do it in one of our team rooms at one of our pair programming workstations). Don’t your feet/back/legs/whatever get sore? Not so much. Occasionally my lower back will feel it if I’ve been working while standing or walking for a long time. I find that making sure the desk is at the right height so that my arms can be in the correct position (forearms parallel to floor) helps this. A little bit of stretching takes care of it for me. Also sometimes my Achilles are tight, but no more so than if I’d done a lot of walking-sans-working, and again stretching resolves the issue. If you do find that walking or standing causes you pain or discomfort, slow down and limit how much you do per day until your body gets used to the additional activity. If your body has been conditioned to not do anything for up to 8 hours a day while you sleep, and another 8 hours a day (or more) while you’re at a desk, plus whatever time you spend sitting in a car or on a couch watching TV,etc., it’s going to notice when you start converting those at-work hours into (light) activity hours. Stick with it, and in a little while your body will be used to the new normal activity you expect of it. How can you work with papers, etc. from a treadmill desk? ot the monitor mounting arms, my desktop space was limited. But with the monitor up off of the desktop, there’s really quite a bit of space available using my setup to spread out papers. Personally, I try to limit the amount of paper I need to work with, but sometimes it’s inevitable, so it’s nice to have the available space. If you’re trying to process bills, or do data entry of some kind, etc. and you need some desk space for the papers, you’ll probably have enough space with my setup. You might need to just stand, rather than walk, if you’re having to reach for papers, etc., but it’s still better than being stuck in a chair for hours. What kind of shoes should you wear? Whatever are comfortable for you. I have a pair of running shoes that I often wear while on the treadmill that are “indoor-only” so they’re clean. But I also will frequently use the treadmill desk in bare feet, or in socks. In the winter months, when it was a bit cooler in the house, I would even walk in slippers. I haven’t had any problems with any of these options, but again, choose whatever footwear works for you. If you’re just getting started, choose shoes that have good support, no different than if you were going to go for fairly long walk. Does the Fitbit Flex work while you’re typing (and walking)? I haven’t tried one myself, but I asked this question of Fitbit and was assured they’d tested it in such scenarios and it would record steps accurately under these circumstances. How easy is it to adjust the height of the Lifespan TR1200 DT? You can do it with one person, but it’s a bit easier with two. There are to dials that you loosen, then pull out, releasing pins in the legs of the desk. While the pins are out, you slide the desk up or down to the desired height, then replace the pins. It’s best to do this with nothing on the desk. Once at the desired height, tighten the dials back down – this will eliminate any tendency for the desktop to wiggle (e.g. if all of the weight is on the back of it, like it is in my case with the mounted monitor stand). How easy is it to use a chair with this setup? Easy. I have a bar-height chair a few steps away that I’ve used a few times. I just set it on the treadmill itself, which has worked fine, but probably isn’t recommended for extended use (I suspect it could cause wear on the treadmill belt, but so far it’s been fine). Alternately, pulling the treadmill itself out from under the desk is quite easily done. There are two cables, a power cable and a small serial cable that connects it to the desk (and the controller on the front of the desk), that need undone, but that’s it. There are wheels on the front of the treadmill, so if you just pick up the back of it, it will roll out of the way, as long as you have some room to maneuver. Then you can stand (off of the treadmill) or put a (high) chair there if you’re taking an extended break from walking. I haven’t done this, but the whole operation should take about 2 minutes (unless you’re very tight on space, in which case it might take longer). I recorded myself walking and typing (and coding!) at different speeds on my Twitch.tv/ardalis channel. You can view the recording on YouTube.